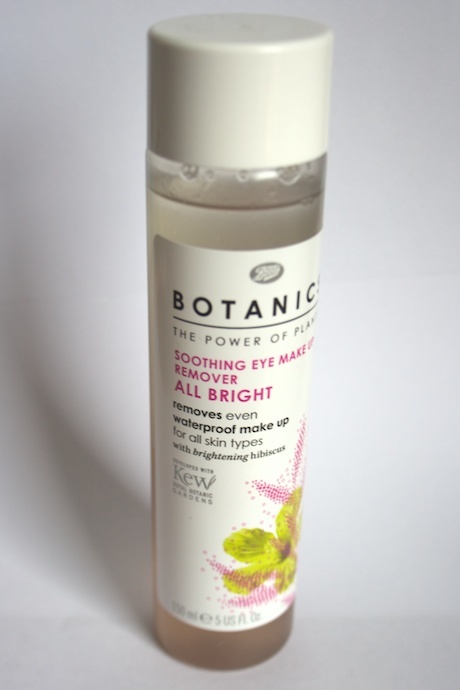 When boot's relaunched the botanics range I got a few of the products to try and for me there was one product that stood out from the rest and that was the All bright eye soothing eye make up remover. I personally wear quite a bit of eye make up so I am always looking for a good remover that is sensitive around my eyes and that will take of all my eye make up and help condition the lashes and I am happy to say that the botanics eye make up remover ticked all three boxes!! There are two separate parts to this remover, the clear oil phase is used to effectively take away impurities and make up including waterproof make up, and the aqueous phase helps soothe the eye area and helps to condition the lashes, it gets the coloured tint from the ingredient hibiscus which exfoliates and helps to brighten the eye area. Because it is separated you need to shake the product well before using it. It is priced at £3.99 but is still on offer with a third off so is currently only £2.66!! I really love this eye make up remover and will continue to repurchase it as my go to eye make up remover! Such a good product at a bargain price.